This simple four cheese enchilada recipe is perfect for any Mexican food lover. Requiring only 10 minutes of prep work and 30 minutes of cook time, this cheesy enchilada can easily turn into your go to dinner! 2 In 12-inch skillet, brown ground beef and chili powder over medium-high heat; drain, if desired. 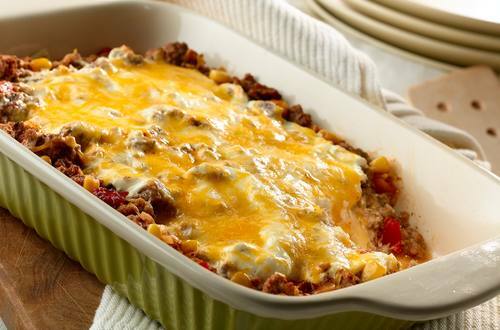 3 In a medium bowl combine Hellmann's® or Best Foods® Real Mayonnaise, salsa and cooked beef. 4 In 13 x 9-inch baking dish, arrange 3 tortillas overlapping layers. Evenly spread 1/2 of the ground beef mixture, then 1/2 of the cheese; repeat layers. 5 Bake covered 20 minutes. Uncover and bake an additional 5 minutes.